People are coming back for more. 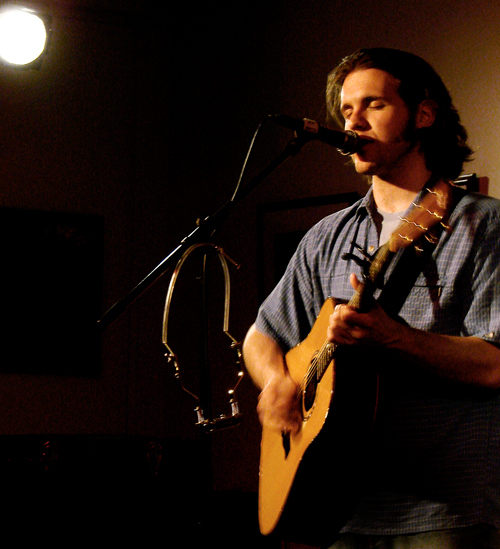 Spooner released his first album Lost Houses in October of 2002. The album featured a young musician demonstrating tremendous musical maturity. The highlight of the album is his voice. It’s controlled beauty perfectly overlaps a fun acoustic guitar that sings sweetly in “Cry Me To Sleep” and refreshingly twangy in “Pickup Truck.” The album lifted the Maine-based songwriter to the status of musician and soon after he added a rhythm section composing Adam Frederick and Reed Chambers. The Flame You Follow followed five years later. The acoustic guitar was joined by an organ and horns. The album explored several different genres and portrayed an even stronger grip over instrumental and vocal poise. Like a composed quarterback, Spooner leads his band down field while remaining in the pocket, strong and incredibly talented. No wonder why he has been recognized as both a musician and lyricist. Sea Monster, his most recent release, hit the stores in October of this year and is perhaps his best combination of songs thus far in his young career. It was recorded in Maine with his mates and unearthed some new musical territory. A complete change of gears. His voice remains the same, but, the lyric becomes even more personal and somber and the song transforms from blues to a melancholic mixture. But, this expresses a rare skill. He effortlessly switches genre on the same album. Perhaps this is why the album cover features a scuba diver. Spooner dives into the mysterious realm of the mostly unexplored ocean. He is not sure what he will find, but, with his musical talent, it is going to be melodious.